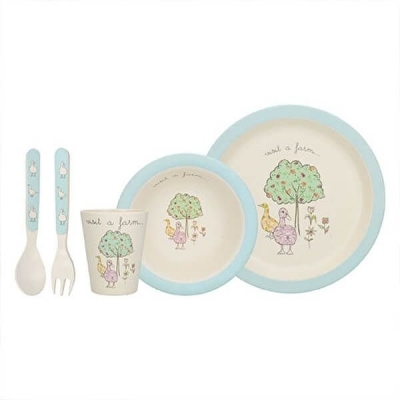 Visit A Farm is an adorable dinnerware range for children that is made from renewable pressed bamboo fibre. This material makes these Visit A Farm pieces lightweight and shatter resistant - perfect for dinner time! This Duck set features a pale blue colour and shows sweet little ducks in a field next to a tree. The material used to make the Visit A Farm pieces is pressed bamboo fibre - this is a renewable material, making this set eco-friendly and kind to the planet. The set includes: plate, bowl, tumbler, spoon and fork.